I love trying new restaurants; it’s one of my favorite things to do. That’s why I was overwhelmingly excited to get the opportunity to try out DOMA Land + Sea in Cedarhurst, Long Island. 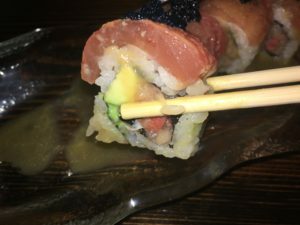 I knew nothing about their offerings or this area of Long Island, so I had no idea what to expect other than checking out the menu beforehand. Let me start by saying that I had one of the best meals I’ve ever had at DOMA, and I’ll for sure be going back. DOMA Land +Sea opened three short months ago in September 2017. Created by brothers Boris and Edward Safaniev, DOMA technically classifies as an “American steakhouse”. However, since ‘doma’ means ‘house or dwelling’ in Russian, this restaurant was created with the intention to serve any guest in any situation. 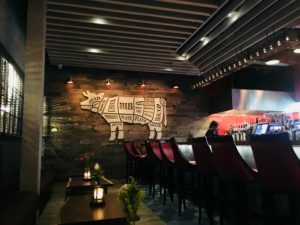 The layout of the space was one of the first things that I noticed when entering the restaurant directly across from the Cedarhurst LIRR station. The interior of DOMA Land + Sea is set up so each room in the restaurant reflects a room in someone’s own home. After walking in, you’ll immediately feel welcomed as if you walked into a friend’s kitchen. The main area where everyone is seated is designed to feel like a family or living room. This is where I was seated for dinner. 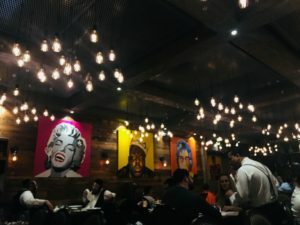 The room, filled with bright paintings of icons like Marilyn Monroe and hundreds of hanging light bulbs leave you feeling warm and comfortable to enjoy your meal. Another really special feature that DOMA provides is the fact that the restaurant is kosher. It’s typically hard to find kosher steak houses that have reasonable price points. But this restaurant definitely draws out a crowd. I visited on a Sunday night at 6 pm, and when I left at 7:30 pm it was a full house. I was shocked by how crowded it was on a Sunday night, but I think it just speaks to how good the food is. Now, let’s get into what I ordered. I brought a friend with me to help me take photos and enjoy some good conversation. First we started our dining experience with something to drink. My friend got a glass of wine while I found myself staring at the cocktail menu. 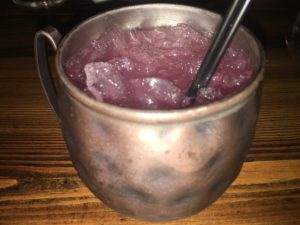 I ordered the Blue Mule ($14), a delicious combination of muddled berries, vodka, ginger syrup, lime juice and tonic. I highly recommend the drink; seriously it was one of the best cocktails I’ve ever had. My biggest problem with DOMA (that’s not even a problem) is that their menu is filled from top to bottom with too many delicious items to choose from. 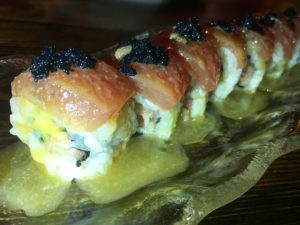 I checked out the menu beforehand, and decided without a doubt that I wanted to try their Tuna Black Truffle specialty roll ($23), so we got that as a starter. The combination of traditional sushi and truffle was everything I dreamed it would be. Next up was the main course. 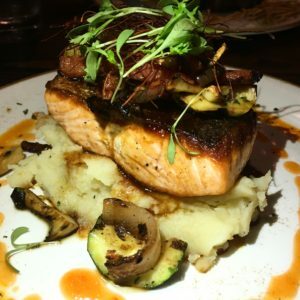 I ordered the steakhouse salmon ($36) and my friend ordered one of the menu’s six steaks ($55). One thing I quickly realized about this restaurant is that they pride themselves on the presentation of their dishes. Everything that we ordered was delivered on such a beautiful plate that my main dish was almost (almost being the operative word) too pretty to eat. This was the most delicious salmon I’ve ever had. It was cooked perfectly, and the honeycomb-chili glaze was the perfect kick to add to the dish. 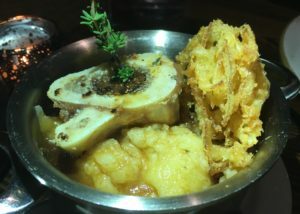 We also ordered the bone marrow mashed ($10) which was a little outside of my comfort zone, but delicious nonetheless. Finally it was time for dessert. I got the ‘Mr. Gregs Apple Tortada’ that came inside of a caramel dome. 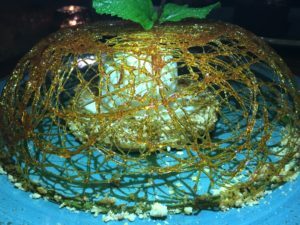 Yes, you read that correctly, a caramel DOME. See below for a photo of the dessert that took me almost 5 minutes before I destroyed it because it was too beautiful. Our waiter, who by the way was AMAZING, came over to let me know it was edible in a joking manner. Each dessert was ($14) and there were a variety of options like a cotton candy tower and a stack of donuts. The food was amazing, the waiters were amazing, and the vibes of the restaurant were amazing. Overall, I’ll be going back to DOMA for special occasions (because I’m a little bit broke) but I think that this restaurant is the perfect place to celebrate any occasion with friends and family. HUGE thank you again to DOMA Land + Sea for having me and to Marissa for setting up the reservation. DOMA Land + Sea is open in Cedarhurst while their sister restaurant, Cork & Slice (a kosher dairy Italian spot), is open right next door. Call to make your reservations today (516) 881-7712. You won’t regret it! ← Bryant Park’s Holiday Winter Village is Open!